As my daughter approaches that preteen age, I'm looking more at Young Adult (YA) books because we all know that teen readers usually go on to be life-long bibliophiles. In recent weeks, I've been sent two novellas for younger readers, one being Dead Time. Isabella is a big fish in a small rural pond. She lives in a sprawling home, which her mother soon tires of. An only child, Isabella finds herself alone with her important father when her mother moves to live with a man half her age where the palm trees grow. Her father's busy schedule doesn't change after his wife leaves. In fact, he tells Isabella that at age 12, she is old enough to be on her own. He gives her full run of the house, leaving her some chores, which she gets her older boyfriend Sergei to do in exchange for favours. The father even hires an interior designer, whom Isabella instructs on how to redecorate the home. Fifteen-year-old Isabella has her nineteen-year-old boyfriend Sergei right where she wants him. Everything is under her control until Lulu has the unmitigated gall to wink at her boyfriend. Isabella's security is threatened, throwing her into a jealous rage behind her composed exterior. She orchestrates and exacts revenge by getting Sergei to do her dirty work, or maybe just take the blame for it, but she doesn't have the maturity at 15 to devise a flawless plan. Consequently, our poor little rich girl finds herself in remand custody--dead time--at a youth detention centre. This is a dark story that the young adult reader will have a hard time putting down. I read it twice to see whether Isabella perpetrated her own own vengeance or whether she coerced her juvenile offender boyfriend into doing it for her. The author makes us read right to the very last page to find out who the perpetrator of this heinous crime actually is. The author does a wonderful job of rendering the powerful emotion of adolescent jealousy, which is further fueled by Isabella's profound insecurity and need for control. Her jealousy is not only piqued by Lulu, but also by a woman she sees her father with in the city. Isabella is furious with the woman for occupying Dad's precious time. This lady is the bad person, not her father who chooses her company, a nuance that gives away our protagonist's age. Isabella is conniving and uses coercion and manipulation to get what she wants. The teen reader will see how these methods may lead to a desired outcome but that this slippery slope also leads to onerous and nightmarish consequences. 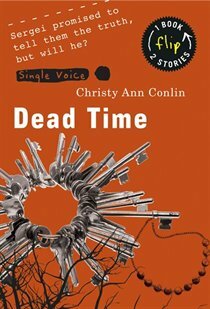 Dead Time is a page-turner that will readily appeal to teens aged 15 to 18, and most likely their mothers too. Mom and daughter may even have some interesting conversations related to a few themes in the book. A bonus for readers, Dead Time is a flip book and has another novella, Shelter by Jen Sookfong Lee, on the other side. : Review: Dead TimeTweet this!